Stocks rallied again last week after the Federal Reserve voted not to raise interest rates this month. While few expected the Fed to act last week, official statements suggest the path to higher rates looks clearer. For the week, the S&P 500 gained 1.19%, the Dow grew 0.76%, the NASDAQ added 1.17%, and the MSCI EAFE stayed stable. Let’s dig more deeply into the Fed’s recent statements. The Fed cited continued strength in the labor market, economic growth, and better wage growth in its case for higher interest rates. However, tepid inflation (largely due to lower energy prices) and a desire to get the timing right caused most of the Federal Open Market Committee (FOMC) to vote to hold rates steady. Three members of the FOMC dissented from the majority vote, believing that the Fed should have raised interest rates this month. One dissident, Boston Fed President Eric Rosengren, believes that the labor market could overheat in 2017, potentially derailing the economic recovery if action isn’t taken. An overheating labor market could send wages to unsustainably high levels while productivity (output per worker per hour) falls. While higher wages might sound pretty good to American workers, unsustainable labor market trends could lead to the sharp recessionary contraction economists want to avoid. However, the health of the labor market doesn’t boil down to a single measure of unemployment, and the rest of the committee seems to believe that raising interest rates too soon is riskier than potentially raising them too late. The market appears to agree, and investors see the Fed reinforcing the idea that the economy still has room to grow. At least one Wall Street analyst believes we’re in the “sixth or seventh inning of a nine inning game.” Despite the Fed’s increasingly hawkish tone about raising interest rates, Wall Street isn’t fully convinced the central bank will pull the trigger in December. Though the FOMC will meet again in November, the Fed is unlikely to make a move until after the election. 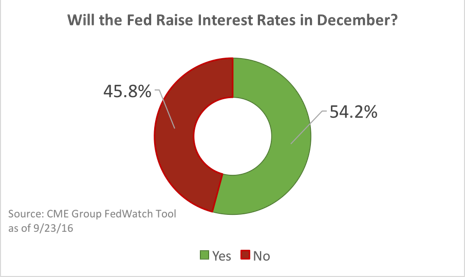 The latest estimate of trading interest shows that traders view the odds of higher rates in December at 54.2%. The Fed has worked hard to convince the public that it intends to raise rates soon. Why? One of the tools the central bank can use to affect markets is that of its “bully pulpit,” the leverage of its powerful position. In the past, the Fed has used the bully pulpit to sound the warning about irrational market highs and give Americans plenty of notice about future policy moves. The Fed hopes that telegraphing plays will give markets time to digest the news and avoid a shock. This week, Monday’s presidential debate and a key meeting of Organization of the Petroleum Exporting Countries (OPEC) members could lead to more market volatility. Oil prices have been a major driver of market movements this year and movement toward freezing production (thereby reducing the supply glut that is contributing to low prices) would cause volatility. How likely is a coordinated production freeze? Not very likely since it would require historic cooperation between geopolitical opponents such as Saudi Arabia and Iran. We’ll keep you informed.